194:0.1 ABOUT ONE O’CLOCK, as the one hundred and twenty believers were engaged in prayer, they all became aware of a strange presence in the room. At the same time these disciples all became conscious of a new and profound sense of spiritual joy, security, and confidence. This new consciousness of spiritual strength was immediately followed by a strong urge to go out and publicly proclaim the gospel of the kingdom and the good news that Jesus had risen from the dead. 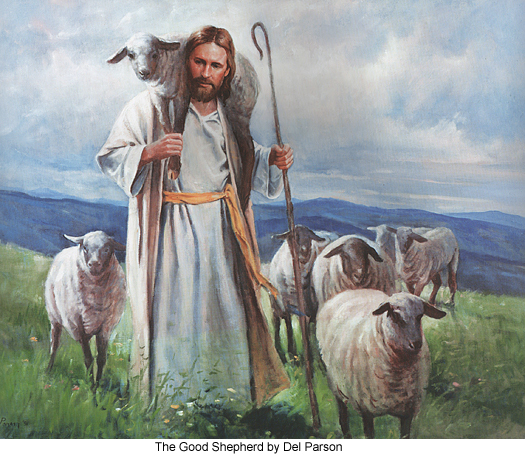 194:1.2 It was about two o’clock when Peter stood up in that very place where his Master had last taught in this temple, and delivered that impassioned appeal which resulted in the winning of more than two thousand souls. The Master had gone, but they suddenly discovered that this story about him had great power with the people. No wonder they were led on into the further proclamation of that which vindicated their former devotion to Jesus and at the same time so constrained men to believe in him. 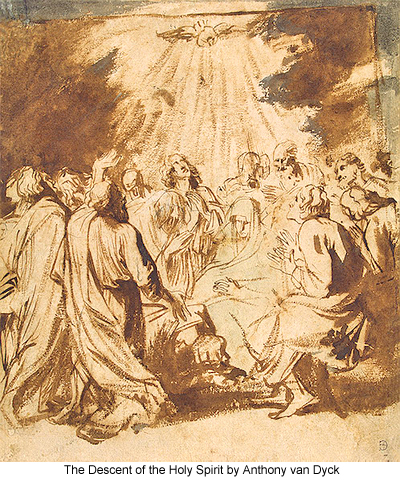 Six of the apostles participated in this meeting: Peter, Andrew, James, John, Philip, and Matthew. They talked for more than an hour and a half and delivered messages in Greek, Hebrew, and Aramaic, as well as a few words in even other tongues with which they had a speaking acquaintance. 194:1.4 By half past four o’clock more than two thousand new believers followed the apostles down to the pool of Siloam, where Peter, Andrew, James, and John baptized them in the Master’s name. And it was dark when they had finished with baptizing this multitude. 194:2.1 Jesus lived on earth and taught a gospel which redeemed man from the superstition that he was a child of the devil and elevated him to the dignity of a faith son of God. Jesus’ message, as he preached it and lived it in his day, was an effective solvent for man’s spiritual difficulties in that day of its statement. And now that he has personally left the world, he sends in his place his Spirit of Truth, who is designed to live in man and, for each new generation, to restate the Jesus message so that every new group of mortals to appear upon the face of the earth shall have a new and up-to-date version of the gospel, just such personal enlightenment and group guidance as will prove to be an effective solvent for man’s ever-new and varied spiritual difficulties. 194:2.2 The first mission of this spirit is, of course, to foster and personalize truth, for it is the comprehension of truth that constitutes the highest form of human liberty. Next, it is the purpose of this spirit to destroy the believer’s feeling of orphanhood. Jesus having been among men, all believers would experience a sense of loneliness had not the Spirit of Truth come to dwell in men’s hearts. 194:2.3 This bestowal of the Son’s spirit effectively prepared all normal men’s minds for the subsequent universal bestowal of the Father’s spirit (the Adjuster) upon all mankind. In a certain sense, this Spirit of Truth is the spirit of both the Universal Father and the Creator Son. 194:2.6 Next, the Spirit of Truth came to help the believer to witness to the realities of Jesus’ teachings and his life as he lived it in the flesh, and as he now again lives it anew and afresh in the individual believer of each passing generation of the spirit-filled sons of God. 194:2.8 Jesus lived a life which is a revelation of man submitted to the Father’s will, not an example for any man literally to attempt to follow. This life in the flesh, together with his death on the cross and subsequent resurrection, presently became a new gospel of the ransom which had thus been paid in order to purchase man back from the clutch of the evil one—from the condemnation of an offended God. Nevertheless, even though the gospel did become greatly distorted, it remains a fact that this new message about Jesus carried along with it many of the fundamental truths and teachings of his earlier gospel of the kingdom. And, sooner or later, these concealed truths of the fatherhood of God and the brotherhood of men will emerge to effectually transform the civilization of all mankind. 194:2.9 But these mistakes of the intellect in no way interfered with the believer’s great progress in growth in spirit. In less than a month after the bestowal of the Spirit of Truth, the apostles made more individual spiritual progress than during their almost four years of personal and loving association with the Master. Neither did this substitution of the fact of the resurrection of Jesus for the saving gospel truth of sonship with God in any way interfere with the rapid spread of their teachings; on the contrary, this overshadowing of Jesus’ message by the new teachings about his person and resurrection seemed greatly to facilitate the preaching of the good news. 194:2.10 The term “baptism of the spirit,” which came into such general use about this time, merely signified the conscious reception of this gift of the Spirit of Truth and the personal acknowledgment of this new spiritual power as an augmentation of all spiritual influences previously experienced by God-knowing souls. 194:3.1 Many queer and strange teachings became associated with the early narratives of the day of Pentecost. In subsequent times the events of this day, on which the Spirit of Truth, the new teacher, came to dwell with mankind, have become confused with the foolish outbreaks of rampant emotionalism. The chief mission of this outpoured spirit of the Father and the Son is to teach men about the truths of the Father’s love and the Son’s mercy. These are the truths of divinity which men can comprehend more fully than all the other divine traits of character. The Spirit of Truth is concerned primarily with the revelation of the Father’s spirit nature and the Son’s moral character. The Creator Son, in the flesh, revealed God to men; the Spirit of Truth, in the heart, reveals the Creator Son to men. When man yields the "fruits of the spirit" in his life, he is simply showing forth the traits which the Master manifested in his own earthly life. When Jesus was on earth, he lived his life as one personality —Jesus of Nazareth. As the indwelling spirit of the “new teacher,” the Master has, since Pentecost, been able to live his life anew in the experience of every truth-taught believer. 194:3.2 Many things which happen in the course of a human life are hard to understand, difficult to reconcile with the idea that this is a universe in which truth prevails and in which righteousness triumphs. It so often appears that slander, lies, dishonesty, and unrighteousness—sin—prevail. Does faith, after all, triumph over evil, sin, and iniquity? It does. And the life and death of Jesus are the eternal proof that the truth of goodness and the faith of the spirit-led creature will always be vindicated. They taunted Jesus on the cross, saying, “Let us see if God will come and deliver him.” It looked dark on that day of the crucifixion, but it was gloriously bright on the resurrection morning; it was still brighter and more joyous on the day of Pentecost. The religions of pessimistic despair seek to obtain release from the burdens of life; they crave extinction in endless slumber and rest. These are the religions of primitive fear and dread. The religion of Jesus is a new gospel of faith to be proclaimed to struggling humanity. This new religion is founded on faith, hope, and love. 194:3.3 To Jesus, mortal life had dealt its hardest, cruelest, and bitterest blows; and this man met these ministrations of despair with faith, courage, and the unswerving determination to do his Father’s will. Jesus met life in all its terrible reality and mastered it—even in death. He did not use religion as a release from life. The religion of Jesus does not seek to escape this life in order to enjoy the waiting bliss of another existence. The religion of Jesus provides the joy and peace of another and spiritual existence to enhance and ennoble the life which men now live in the flesh. 194:3.5 On the day of Pentecost the religion of Jesus broke all national restrictions and racial fetters. It is forever true, “Where the spirit of the Lord is, there is liberty.” On this day the Spirit of Truth became the personal gift from the Master to every mortal. This spirit was bestowed for the purpose of qualifying believers more effectively to preach the gospel of the kingdom, but they mistook the experience of receiving the outpoured spirit for a part of the new gospel which they were unconsciously formulating. 194:3.8 The coming of the Spirit of Truth on Pentecost made possible a religion which is neither radical nor conservative; it is neither the old nor the new; it is to be dominated neither by the old nor the young. The fact of Jesus’ earthly life provides a fixed point for the anchor of time, while the bestowal of the Spirit of Truth provides for the everlasting expansion and endless growth of the religion which he lived and the gospel which he proclaimed. The spirit guides into all truth; he is the teacher of an expanding and always-growing religion of endless progress and divine unfolding. This new teacher will be forever unfolding to the truth-seeking believer that which was so divinely folded up in the person and nature of the Son of Man. 194:3.9 The manifestations associated with the bestowal of the “new teacher,” and the reception of the apostles' preaching by the men of various races and nations gathered together at Jerusalem, indicate the universality of the religion of Jesus. The gospel of the kingdom was to be identified with no particular race, culture, or language. This day of Pentecost witnessed the great effort of the spirit to liberate the religion of Jesus from its inherited Jewish fetters. Even after this demonstration of pouring out the spirit upon all flesh, the apostles at first endeavored to impose the requirements of Judaism upon their converts. Even Paul had trouble with his Jerusalem brethren because he refused to subject the gentiles to these Jewish practices. No revealed religion can spread to all the world when it makes the serious mistake of becoming permeated with some national culture or associated with established racial, social, or economic practices. 194:3.11 Pentecost, with its spiritual endowment, was designed forever to loose the religion of the Master from all dependence upon physical force; the teachers of this new religion are now equipped with spiritual weapons. They are to go out to conquer the world with unfailing forgiveness, matchless good will, and abounding love. They are equipped to overcome evil with good, to vanquish hate by love, to destroy fear with a courageous and living faith in truth. Jesus had already taught his followers that his religion was never passive; always were his disciples to be active and positive in their ministry of mercy and in their manifestations of love. No longer did these believers look upon Yahweh as “the Lord of Hosts.” They now regarded the eternal Deity as the “God and Father of the Lord Jesus Christ.” They made that progress, at least, even if they did in some measure fail fully to grasp the truth that God is also the spiritual Father of every individual. 194:3.12 Pentecost endowed mortal man with the power to forgive personal injuries, to keep sweet in the midst of the gravest injustice, to remain unmoved in the face of appalling danger, and to challenge the evils of hate and anger by the fearless acts of love and forbearance. Urantia has passed through the ravages of great and destructive wars in its history. All participants in these terrible struggles met with defeat. There was but one victor; there was only one who came out of these embittered struggles with an enhanced reputation—that was Jesus of Nazareth and his gospel of overcoming evil with good. The secret of a better civilization is bound up in the Master’s teachings of the brotherhood of man, the good will of love and mutual trust. 194:3.15 Both the mother and brother of Jesus were present among the one hundred and twenty believers, and as members of this common group of disciples, they also received the outpoured spirit. They received no more of the good gift than did their fellows. No special gift was bestowed upon the members of Jesus’ earthly family. 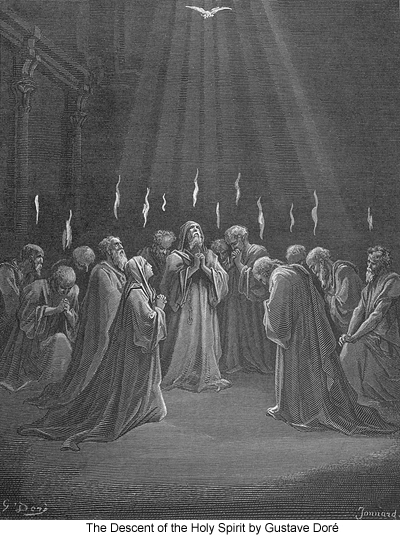 Pentecost marked the end of special priesthoods and all belief in sacred families. 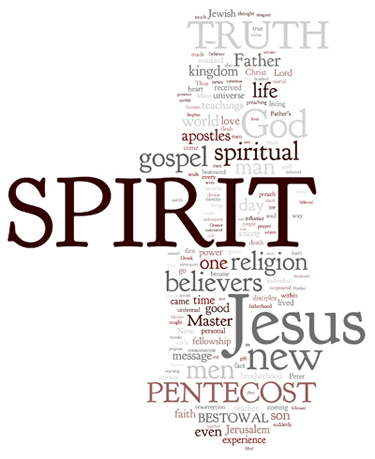 194:3.17 Pentecost was the call to spiritual unity among gospel believers. When the spirit descended on the disciples at Jerusalem, the same thing happened in Philadelphia, Alexandria, and at all other places where true believers dwelt. It was literally true that “there was but one heart and soul among the multitude of the believers.” The religion of Jesus is the most powerful unifying influence the world has ever known. 194:4.1 When Jesus was so suddenly seized by his enemies and so quickly crucified between two thieves, his apostles and disciples were completely demoralized. The thought of the Master, arrested, bound, scourged, and crucified, was too much for even the apostles. They forgot his teachings and his warnings. He might, indeed, have been “a prophet mighty in deed and word before God and all the people,” but he could hardly be the Messiah they had hoped would restore the kingdom of Israel. 194:4.2 Then comes the resurrection, with its deliverance from despair and the return of their faith in the Master’s divinity. 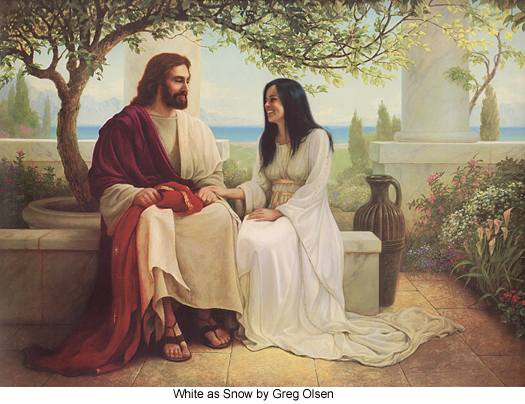 Again and again they see him and talk with him, and he takes them out on Olivet, where he bids them farewell and tells them he is going back to the Father. He has told them to tarry in Jerusalem until they are endowed with power—until the Spirit of Truth shall come. And on the day of Pentecost this new teacher comes, and they go out at once to preach their gospel with new power. They are the bold and courageous followers of a living Lord, not a dead and defeated leader. The Master lives in the hearts of these evangelists; God is not a doctrine in their minds; he has become a living presence in their souls. 194:4.7 Unmistakably, a new fellowship was arising in the world. “The multitude who believed continued steadfastly in the apostles' teaching and fellowship, in the breaking of bread, and in prayers.” They called each other brother and sister; they greeted one another with a holy kiss; they ministered to the poor. It was a fellowship of living as well as of worship. They were not communal by decree but by the desire to share their goods with their fellow believers. They confidently expected that Jesus would return to complete the establishment of the Father’s kingdom during their generation. This spontaneous sharing of earthly possessions was not a direct feature of Jesus’ teaching; it came about because these men and women so sincerely and so confidently believed that he was to return any day to finish his work and to consummate the kingdom. But the final results of this well-meant experiment in thoughtless brotherly love were disastrous and sorrow-breeding. Thousands of earnest believers sold their property and disposed of all their capital goods and other productive assets. With the passing of time, the dwindling resources of Christian “equal-sharing” came to an end—but the world did not. Very soon the believers at Antioch were taking up a collection to keep their fellow believers at Jerusalem from starving. 194:4.8 In these days they celebrated the Lord’s Supper after the manner of its establishment; that is, they assembled for a social meal of good fellowship and partook of the sacrament at the end of the meal. 194:4.9 At first they baptized in the name of Jesus; it was almost twenty years before they began to baptize in “the name of the Father, the Son, and the Holy Spirit.” Baptism was all that was required for admission into the fellowship of believers. They had no organization as yet; it was simply the Jesus brotherhood. 194:4.10 This Jesus sect was growing rapidly, and once more the Sadducees took notice of them. The Pharisees were little bothered about the situation, seeing that none of the teachings in any way interfered with the observance of the Jewish laws. 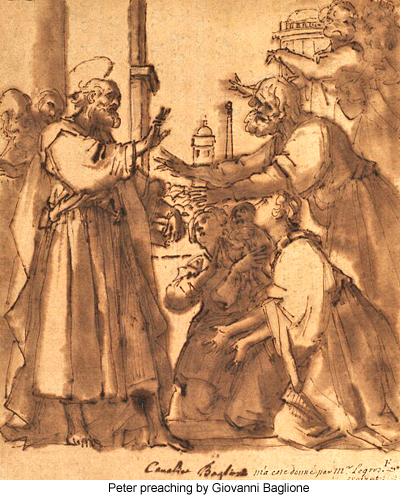 But the Sadducees began to put the leaders of the Jesus sect in jail until they were prevailed upon to accept the counsel of one of the leading rabbis, Gamaliel, who advised them: “Refrain from these men and let them alone, for if this counsel or this work is of men, it will be overthrown; but if it is of God, you will not be able to overthrow them, lest haply you be found even to be fighting against God.” They decided to follow Gamaliel’s counsel, and there ensued a time of peace and quiet in Jerusalem, during which the new gospel about Jesus spread rapidly. 194:4.11 And so all went well in Jerusalem until the time of the coming of the Greeks in large numbers from Alexandria. Two of the pupils of Rodan arrived in Jerusalem and made many converts from among the Hellenists. Among their early converts were Stephen and Barnabas. These able Greeks did not so much have the Jewish viewpoint, and they did not so well conform to the Jewish mode of worship and other ceremonial practices. And it was the doings of these Greek believers that terminated the peaceful relations between the Jesus brotherhood and the Pharisees and Sadducees, Stephen and his Greek associate began to preach more as Jesus taught, and this brought them into immediate conflict with the Jewish rulers. In one of Stephen’s public sermons, when he reached the objectionable part of the discourse, they dispensed with all formalities of trial and proceeded to stone him to death on the spot. 194:4.12 Stephen, the leader of the Greek colony of Jesus’ believers in Jerusalem, thus became the first martyr to the new faith and the specific cause for the formal organization of the early Christian church. This new crisis was met by the recognition that believers could not longer go on as a sect within the Jewish faith. They all agreed that they must separate themselves from unbelievers; and within one month from the death of Stephen the church at Jerusalem had been organized under the leadership of Peter and James the brother of Jesus had been installed as its titular head. 194:4.13 And then broke out the new and relentless persecutions by the Jews, so that the active teachers of the new religion about Jesus, which subsequently at Antioch was called Christianity, went forth to the ends of the empire proclaiming Jesus. In carrying this message, before the time of Paul the leadership was in Greek hands; and these first missionaries, as also the later ones, followed the path of Alexander’s march of former days, going by way of Gaza and Tyre to Antioch and then over Asia Minor to Macedonia, then on to Rome and to the uttermost parts of the empire.